There are certain players on certain teams that are considered bellweather perfomers. On the Yankees, players like Aaron Judge, Giancarlo Stanton, and Luis Severino are needed and expected to play up to the backs of their baseball cards for the Bombers to have any chance of winning a championship. On the Mets, the expectations of excellence falls on the shoulders of Michael Conforto, Robinson Cano, Jacob deGrom, and Noah Syndergaard. Without those four achieving at high levels. the Mets have no chance to compete for a division title, let alone a World Series championship. Which brings us to the other key players on the major league roster. The ones who are unpredictable, yet, so talented that if all of their bio-rhythms were in place, their mental and physical health were steady, and they played up to their talent, it would put both of these teams squarely in the race for the big trophy at the end of the season. 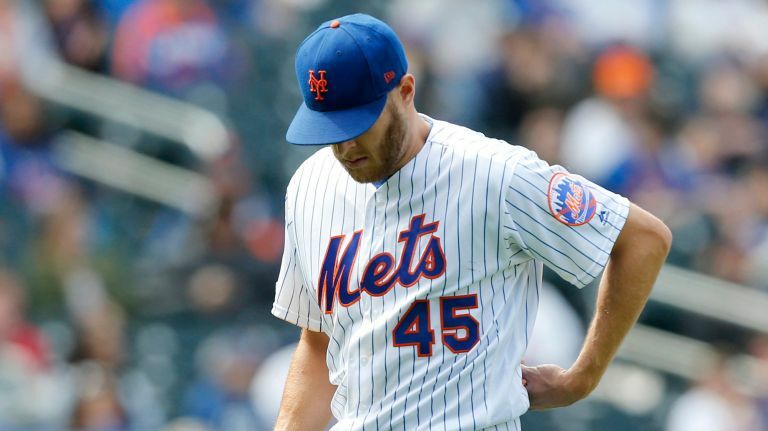 For the Mets, one of the keys, perhaps, THE key to their success in 2019 is Zack Wheeler, currently the number three guy in their pitching rotation. For the Yankees, it is Gary Sanchez, the sometimes moody catcher with Hall of Fame skills but not always Hall of Fame focus and concentration. Yesterday’s games showed us just how crucial these two players are to the fortunes of these teams. The Mets know what they will be getting from deGrom and Syndergaard when they start games every fifth day. The question mark remains Wheeler, who was the second best pitcher in baseball from the All-Star break through October in 2018. Wheeler, who was a number one draft choice, sixth overall pick, by the San Francisco Giants in 2009, has always been viewed as a potential ace, with a 98 mph fastball with movement, sharp breaking ball, and a flexible, live arm that could take the mound every scheduled outing and dominate opposing teams. Sanchez, who broke into the majors and made himself an immediate Hall of Fame candidate after his first half season in 2015, has had more ups and downs in his still-young career than any future Hall of Famer should go through. Most of those downs have been of his own making, through not being able to understand or accept the tough love former manager, Joe Girardi, the old catcher, tried to impart to Sanchez the finer points of the game, especially, defensively. Girardi was fired, some say, because of his relationship with Sanchez, in an era of players having more power than a manager. But yesterday, we saw what Sanchez, still only 26, can do with a bat in his hand. In an era when any offense from a catcher is welcome but not necessarily expected by major league teams, the “San-chize” hit not one, not two, but three home runs in Baltimore. He drove in six runs. And, the Yankees had another cakewalk against the sad Orioles, 15-3. He now has six homers in the season’s first 10 games, and looks to be a happy player. Oddly, after the game, no one expressed shock at yesterday’s output from the young slugger. His teammates have seen him do this before, in bunches, as a rookie and in his second year. Last year, he hit .188. Nobody seems to know why yet, most baseball observers still consider his hitting talent to be the best in the Yankees lineup. The dilemma with Sanchez is, we know he’s one of the scariest hitters in the game, when he has access to his full compliment of physical and mental capabilities. The question is, how do the Yankees keep him happy and thriving? With Sanchez bashing, the Yankee lineup, is one in which nobody can be pitched around. It becomes a nightmare for opposing pitching staffs and it will lead to a season of fastballs for everybody, 1 thru 9. Yesterday, Wheeler pitched against the Washington Nationals in a style reminiscent of the first eight years of his career. He lost his command on his fastball and curve, he lost his control, walking a career-high seven batters in five innings. He generally looked lost out there, a huge disappointment to a Mets organization that has been re-structured from top to bottom by new general manager, Brodie Van Wagenen. But still, at the major league level, this team is programmed to be dependent on its pitching arms. Right now, the Mets are praying for the light to go on again for Wheeler. If it doesn’t, you are looking at Stephen Matz and Jason Vargas needing to pick up the pace to about 15 wins apiece. A tall order which almost guarantees a disappointing season for the Mets.